Is one visit to an exhibition ever enough? Well, not if it's Rodin and the art of ancient Greece. For £64 for a year's membership (one adult only, by Direct Debit) you can go as many times as you like. Each time you will discover more. 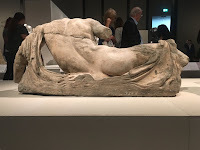 I've shot this Parthenon sculpture (Ilissos, the river god (about 438–432BC), figure A from the corner of the west pediment), from the back to show the way the sculptor has transformed a massive chunk of marble into rippling water eddies at the base, then flesh as Ilissos rises from the watery depths to rest on the river bank. The British Museum, scholarly to a fault, does not give a sculptor's name to any of these figures. They were carved 'in the time of' Pheidias. 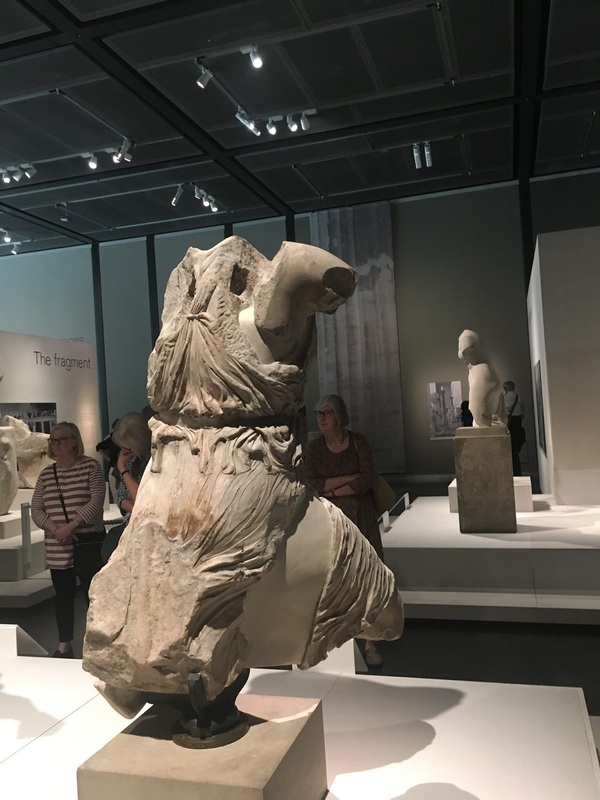 Pheidias is thought to have designed both the Parthenon itself, as its architect, as well as its sculptures. The matter of who did the carving is not resolved. Sculptors, in ancient and modern times, often made sculptural drawings, clay casts or small models. Their assistants then did the actual carving. Rodin did this; Pheidias almost certainly did this. 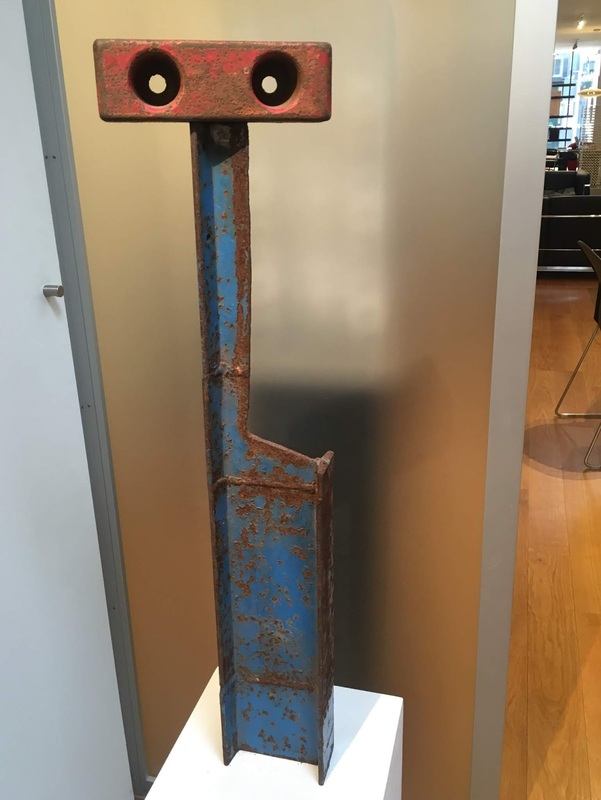 The image left is of a 'flying' sculpture, always on the move. 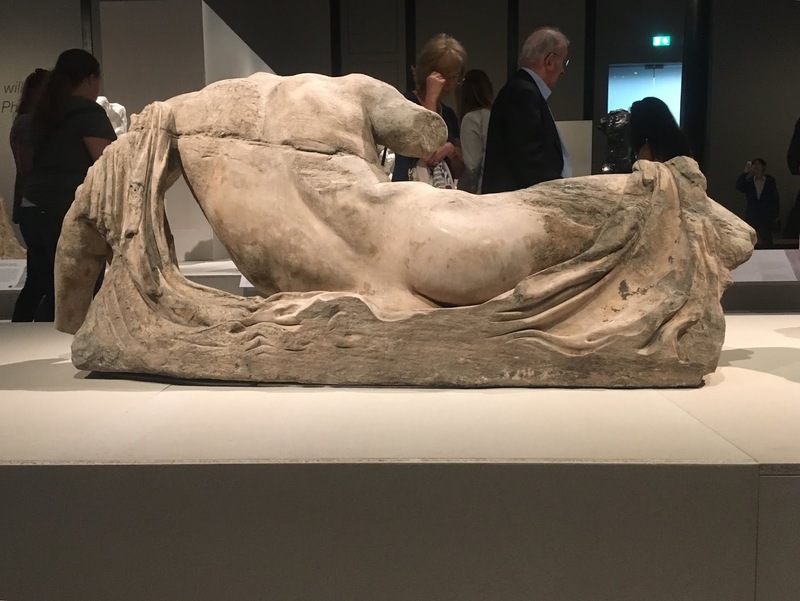 It's Iris, messenger of the gods (about 438–432BC, figure N from the corner of the west pediment). 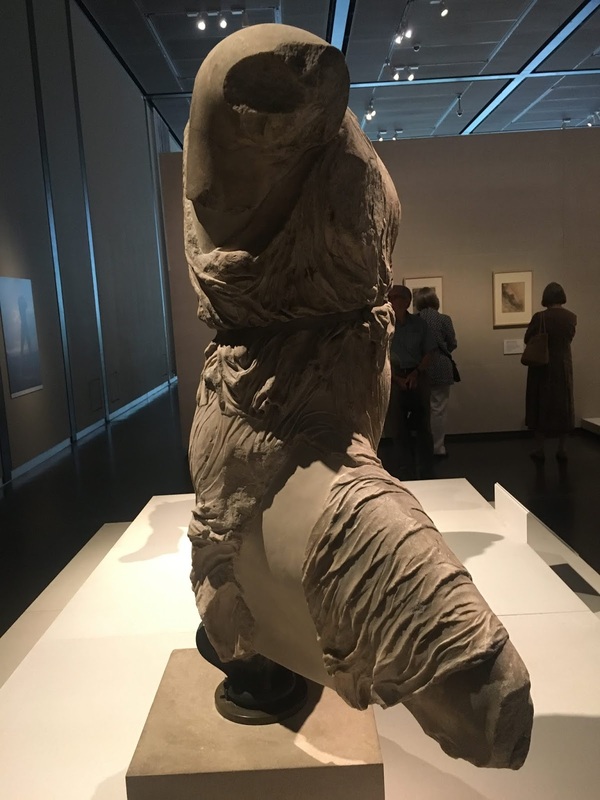 As the legend will tell you, the sculptor not only shows her in flight but captures the air rushing against her diaphanous tunic. Iris' right side showing some of the flowing drapery carved in marble. Over the 2500 years she has been in existence, her head, arms and lower legs have disappeared. 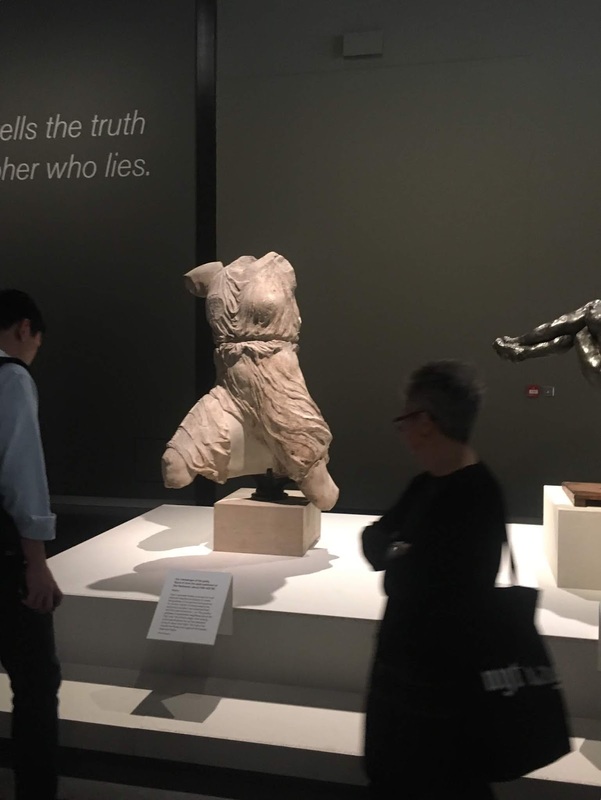 As will be made plain by the rest of this exhibition, the energy, power and emotion invested in even such incomplete figures are what captivated and inspired Rodin when he first saw them during his visit to the British Museum in 1881. Iris from the back: this view shows the drilled out slots where once her bronze wings (which she needed to give her the power of flight) would have fitted. The wings are missing, plunder being an ancient practice. First, allow this new building to work upon you. * The minimalist aesthetic of the anteroom is there precisely to allow your mind to declutter and let go. Then enter the great room. Stand near the entrance (not blocking the entrance obviously). Pause. Still your phone perhaps. And you might like to take advantage of the long bench running to your left and sit down. 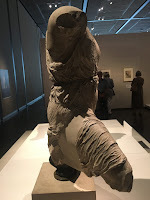 Your eyes may never see a greater piece of dramatic sculptural art than this: Rodin's 1st millennium AD genius partnered with that of Pheidias, in the 1st millennium BC. It's certainly the best exhibition of sculpture I have ever seen. As well as the Dutch state galleries, The Hague is full of thriving commercial galleries. The streets to explore include Toussaintkade, Tasmanstraat, Denneweg, Westeinde and Noordeinde. Type the street name and 'art gallery' into Google to find them. Check the opening times before you go. The venerable De Rijk Fine Art is at Noordeinde 95. It specialises in art concret with a roster of artists inspired by the Dutch ZERO/NUL (1958-1966) movement. Art bought here is likely to keep and appreciate its value as art. 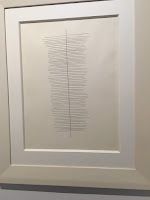 Shown above is the sculpture "Portret van een vriend" (Portrait of a friend)) by Jeff Beer and, below, "T62-99", 1962. an ink on paper drawing by Jan J Schoonhoven. There is much to see and enjoy in this gallery, not least the way the works are displayed in a minimalist but semi-domestic setting.